Decorative paper turkey feathers can add character to a child's Thanksgiving project or to many adult craft items. Turkey feathers can be made from construction paper in a variety of sizes for table displays, greeting cards and other decorations. Make a base piece and add color to the feather in a cartoon or more realistic look. You can make them into a two dimensional item with individual cut out pieces of paper giving the patterns found in a turkey feather. 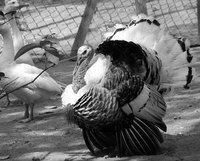 Study photos of turkeys and feathers. Notice the shape and color patterns in the feathers. Use a ruler to draw a rectangular shape on to a piece of lightweight recyclable cardboard in the size you need for your project. Notice how the turkey feather end is a rounded fan shape. Draw the rounded fan shape into the top of the feather pattern. Cut out the pattern template that you have drawn. Place the template on to a piece of light brown construction paper. Trace around the pattern. Trace as many feather shapes as you need. Cut out the feather shapes you need for your project. Color in the patterns and details of the feathers with colored pencils or glue on cutout paper shapes. The paper shapes can be drawn on and cut out of colored construction paper. You can glue the feathers on to skewers or chopsticks if you want to place them into a wreath or floral arrangement.